The BMW 7 Series brings together performance, luxury, and tech, all in one well-appointed sedan. It’s a powerful car to drive. As you’re driving, you may notice certain dashboard symbols, which provide you with relevant information while driving around Westchester County, Yonkers, and Hartsdale. BMW of Westchester wants to make sure you know what these dashboard lights are trying to say. Continue reading to learn about some of the most important dashboard lights, and what should be done when they turn on. 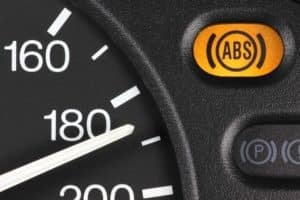 This light is easy to recognize, as it says “ABS.” This means the stability control systems, which are in place, have ceased operation. Drivers can continue to operate the car, but it’s important to drive with caution and brake earlier than you usually would. Be extra careful when it’s raining or snowing, as the slick roads can cause further issues. Have the ABS system checked as soon as possible. If this light turns on in your BMW 7 Series, and it is red, it’s important to take some precautions. The brake fluid level is low, and the car may not be able to brake properly. Without the proper amount of brake fluid, the brakes may not respond as fast as usual. When this light is yellow, the hill assist feature isn’t working as it should. The car may rock back when the parking brake is released. The check engine light can truly mean just about anything. This small engine icon will turn on when there’s a minor issue like a loose gas cap. However, it can also turn on when driving. 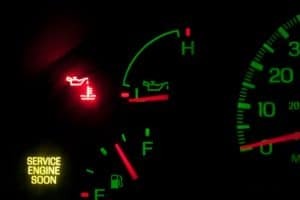 If the light is flashing, the engine could be misfiring, which may cause poor acceleration and could damage the engine. Replacement of spark plugs may be needed, or the ignition coil might need a look. Keep your car at low speeds and find your local BMW service center as soon as possible. This dashboard light looks like an exclamation point with parentheses surrounding it. 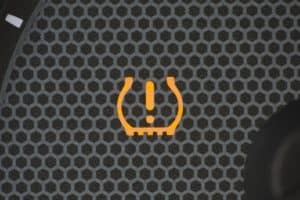 If the light is red, at least one tire has rapidly lost pressure, and your car should be brought to a service center as soon as possible, if it’s safe to drive. If the light is yellow, tire pressure might be off by a little bit. Check all four tires to ensure the pressure is where it should be. Keep in mind that temperature dips can change the tire pressure, so when the seasons change or there’s a particularly cold night, don’t be alarmed if the light turns on. Low tire pressure can cause fuel efficiency issues, so it’s important to keep tires inflated to the correct levels. Whenever a dashboard symbol turns on, you’ll always receive expert service from the technicians at our BMW of Westchester service center. We’re proud to work on the vehicles of Westchester County, Yonkers, and Hartsdale. Have questions about any dashboard symbols? Give us a call today, or stop by our service center.